I'm trying something a bit new today and featuring a cat from the shelter we fostered/adopted Ollie from. There's a lovely senior tuxie lady over at the Central Texas Humane Society who is looking for her forever home. She's been there since September, so it's past time. 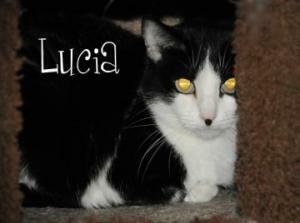 If you've got room and are looking for a sweet little lady, Lucia is her name. The number to call is 254-754-1454. You'll need her name and her ID number A11420789. Oh what a cutie she is! We hope she can find a good forever home soon! 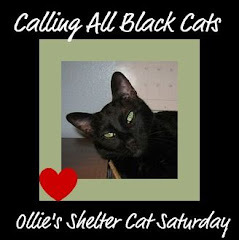 And we are so behind in visising we haven't even said congrats to Ollie on becoming an ex-foster cat! That is such great news!! Isn't she a cutie? I don't have too many local readers, but I told Emily from the shelter that I'd post her in the hopes someone who is in Waco will see it. 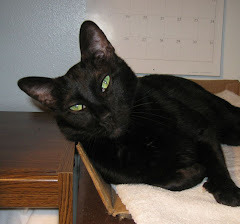 When I was looking for a home for a black kitty who had adopted a friend's deck, my vet's office offered to send the info and picture out to their email list, with a request to send it on to others. And I sent it to my "animal" people friends with the same request. I could tell the "cattitude" from the Sunday pic of Ollie . . .